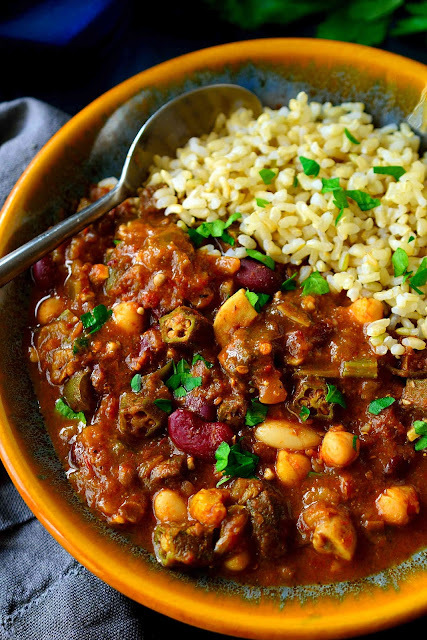 This vegan gumbo recipe is hearty, savory, filling and warming. With a mix of beans, mushrooms and okra, this vegetarian gumbo is cheap to make and full of flavour. Starting with a dark, rich roux, key herbs and spices, and a secret umami ingredient, it’s hard to believe that this vegan gumbo doesn’t have any meat in it! Heat a wide saucepan over medium heat. Add the oil and sprinkle over the flour. Stir or whisk continuously until the roux reaches a dark caramel or milk chocolate colour, a bit darker than peanut butter. It will take about 15 – 20 minutes. Don’t let it burn or you will have to start over. Add the onions and continue stirring continuously until soft. Add the green pepper, celery, garlic and okra. Sauté, stirring frequently for 10 – 15 minutes until the vegetables are soft and the okra slime has disappeared. Add the tomato, 2 ½ cups of stock, mushrooms, beans, thyme, cayenne pepper and bay leaves. Bring to a boil then lower the heat to medium-low and simmer gently for 30 minutes. If you like your gumbo a bit thinner and more soup-like, add as much of the remaining stock as you want. Turn off the heat and ladle a small amount of the gumbo into a small bowl and add the miso paste. Stir well to dissolve and add back to the saucepan. Mix well. Taste the gumbo and add salt to taste (depends on how salty your stock and miso are) and pepper. Serve the gumbo with brown rice and sprinkled with some fresh parsley. 0 Response to "Vegan Gumbo"